I’m about to type something that I can’t even make be true. Ready? My little grandson Jackie will be ONE in two weeks and two days. The good news is that he’s just as cute as ever and each new stage brings so much fun! 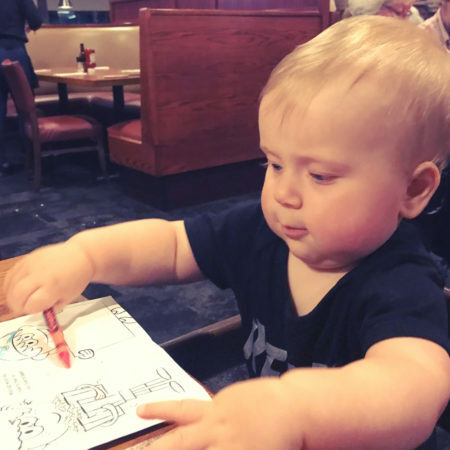 Now that he’s older we can take him to restaurants easily. He had a blast with us last Wednesday night at our local 99. He colored, ate two bags of oyster crackers, had some of my chicken, some of Dale’s baked macaroni & cheese, and some of his mother’s fish. He was admired by many and he shot incredulous looks at the people who walked by him who didn’t stop to tell him he’s cute. You think I’m kidding but I’m not. I swear he’s just so used to being smiled at by . . . everyone . . . that he really does notice when someone doesn’t give him a grin and say he’s adorable. He also loves going grocery shopping with me. He smiles at everyone and loves looking at all of the things on the shelves. 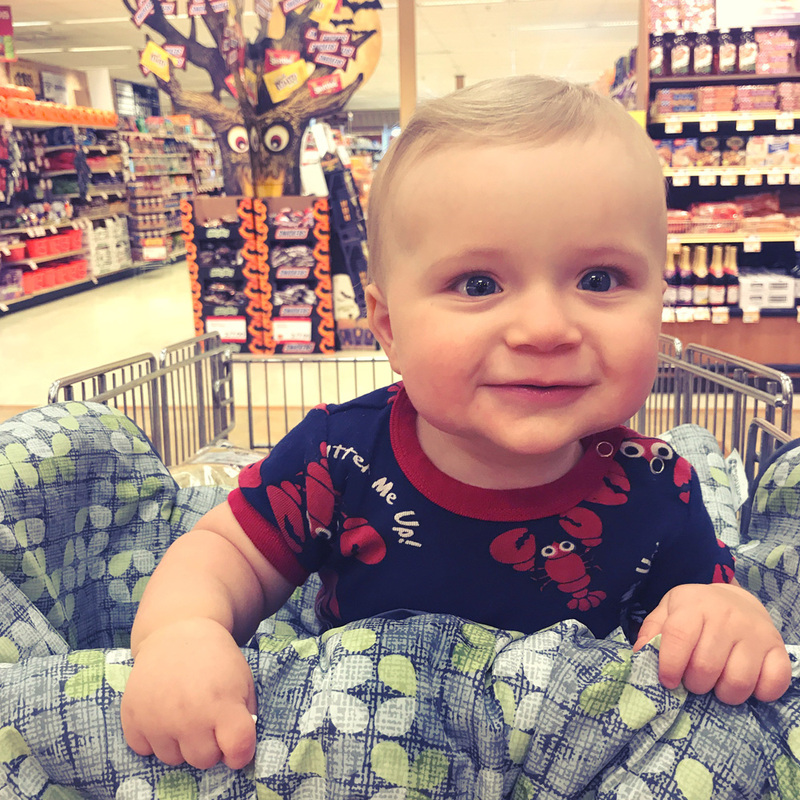 I’d be lying if I didn’t say it’s pretty flattering when people think he’s my baby and not my grandbaby – and that happens at least once on every trip! Last Friday he had his first piece of cheese from the deli and he inhaled it. Seriously, if you’re in this family you have to love cheese. He’s not walking yet but he’s starting to stand on his own and he crawls with great skill. Jack has brought us so much joy and it just keeps getting better! It does seem like Jackie was just born several months ago, but at the same time, also like he’s been part of your family forever. I might enjoy grocery shopping more if I had an adorable young man in the cart who made everyone smile! I didn’t realize he was coming up on a year old! I just always like how he seems to be such a happy kiddo. I’m sure he has his moments (we all do), but what a happy little boy. Give him a birthday kiss from me! He’s as cute as a bug! And how is it that a year has passed?! And we’re lucky because we get to watch all the cuteness! I had the opposite experience, often – people assuming that my own children were my grandchildren – due to our starting childbearing latish and my prematurely white hair. It stung! Happy almost birthday Jack! You’re a cutie! Well, I can believe it. When you get my age, there is some serious time voodoo going on. Months only have 15 days (surely) and the holidays are only 5 months apart. The important part is that he is so healthy, so dang cute, and a little package of happiness of love and will remain so for years. It’s wonderful that you are getting to enjoy him so much. Wow, a year already. He is such a cutie! What a cute little guy! They grow up oh so quickly. Have fun celebrating his first birthday. What a year!! and I do have to say – as much as I love cuddly cute babies, I really adore toddlers. You’re going to have a ball with Jack … I can already tell!